Get Approved for a Bad Credit Auto Loan in Phoenix Today! Owning a car in Phoenix can help you achieve your personal and professional goals. That being said, finding a reliable lender may be difficult if you have low or no credit history. You have to invest time into researching each lender and comparing all the offers you receive in order to find the best one for you. At CompleteAutoLoans.com, we offer a variety of tools that you can use to calculate the total cost of your car, learn more about loans, and ultimately identify a reliable bad credit auto loan provider. Instead of settling for old cars or unfair terms, use the tools you have at your disposal to find the ideal car and the best terms for your loan. Not only will you be able to identify lenders that can help you purchase a used vehicle, but you can also use the loan you take out to build your credit score at the same time. Our main goal is to help you find reliable lenders that offer fair loans. Moreover, we also want to help people that have low or no credit score build up their rating. Because of this, all the tools and resource available on this page are free of costs, so you don’t have to worry about incurring any additional fees by using this page. You can use our tools to find a lender or calculate your expenses and learn more about bad credit auto loans on our resources page. The two most important factors you have to consider when taking out a used car loan are the interest rates and the total amount of the loan. The total auto loan amount is the price of your loan plus interest rates and additional fees that may come on behalf of the bank or dealership. This number will help you figure out if you can afford to make all your payments on time, so make sure you look at it before making any financial commitments. The interest rates you receive will vary depending on your credit score, your income, and numerous other factors. As a rule of thumb, people with higher credit scores tend to get lower interest rates, reducing the overall cost of their loans. If the need for your vehicle is not urgent, taking some time to build your credit score before you apply may be a great way to reduce the interest rates on your loan. As you can imagine, your credit score is the most decisive factor when it comes to getting a line of credit. Be it a credit card, phone contract, or in this case, a used auto loan, having a higher credit score will improve your chances of getting approved. Moreover, because you are likely to receive lower interest rates and more benefits, improving your credit score can even help you save money in the long run. Keep in mind that there is no exact formula to improve your credit score. However, making all your payments on time and in full for the next three to six months is bound to have a positive impact on your rating, which in turn can help you get approved for a bad credit auto loan. The Valley of the Sun offers an incredible combination of rich cultural heritage, strong economic growth, and natural beauty that not many cities can brag of. Known as the Valley of the Sun, Phoenix is the most populous city in Arizona, boasting of more than 1.6 million inhabitants. Located in the Sonoran desert, the Valley of the Sun features a subtropical desert climate. Thanks to a vast irrigation system built by the Hohokam people, the area that now makes up Phoenix is extremely arable. Not only this, but the Valley of the Sun is one of only 13 cities in to have a professional sports team representing them in all four major sports leagues. Moreover, this lively metropolis is home to an array of museums, fine arts venues, performing arts centers, and other attractions that attract locals and tourists alike. 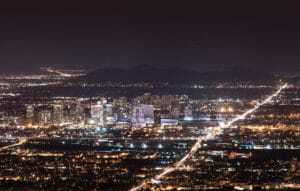 Besides being one of the biggest cities in the US, Phoenix is also among the most naturally gifted. Thanks to these characteristics, most residents of Phoenix either go for vehicles that allow them to pursue outdoor activities or sedans that a very fuel-efficient. Finding a reliable lender may take some time. But, you should be able to locate a loan provider that offer fair deals. At CompleteAutoLoans.com, we have built a network of providers that understand your financial standing. They specialize in providing bad credit auto loans that have fair deals. Learn more at our resources page or use our online application tool to find a reliable lender today!